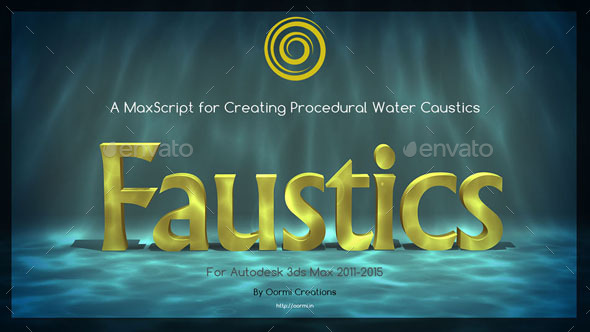 Faustics is a MaxScript for creating procedural water Caustics effect in Autodesk 3ds Max, easily and quickly. Faustics produces beautiful Caustics effects and these are extremely fast to render. No plugins of any kind are needed. The scenes created using Faustics can be rendered without the script. It provides three kinds of Caustics effects for water – Turbulence, Waves and Rain, out of the box. You can blend these effects quickly or add your own animated map also. A simple UI and quick previews let you create complex and beautiful refractive or reflective water Caustics in minutes ! Faustics caters to a beginner as well as advanced users of 3ds Max. A beginner needs to click just one button to start off and an advanced user can customize many aspects of the effect, such as light properties, size, speed, chaos, animation properties and many more things, to get an infinite variety of Caustics. It can be used to create special effects too. It needs no water surface model of any kind, the Caustics are stand alone. The script does not use Photons or any other complex methods that produce physically correct Caustics, but are often very difficult to set up and result in very long render times. It uses procedural maps, so that you get full artistic control and extremely fast renders. The demo scene created using this script renders in less than one second on a Quad Core machine. You can have more than one Caustic source and you can also include only those scene objects in it that need to receive the Caustics. You can customize each source individually. Faustics works with 3ds Max’s Default Scanline Renderer as well as Mental Ray Renderer. It also has a function to export the Caustics animated map for use in a game engines such as Unity3D. Create water Caustics in a Single Click. Multiple Sources of Caustics, where each can have its own settings. Three kinds of built-in effects – Turbulence, Waves and Rain. Enables blending of these three effects. Supports custom animated image sequences or video file as Caustic Maps. Source properties, like color, intensity, type etc can be customized. Turbulence, wave and rain properties can be customized. Each source can independently have its own set of properties and effects. Supports include/exclude of objects that can receive Caustics from each source independently. Exports the animated Caustics map for use in game engines.